Prevents other Pokémon from lowering its stats. X Its body is virtually composed of water. It shoots strange beams from its crystal-like eyes. X Sein Körper besteht aus Wasser. Aus seinen kristallartigen Augen verschießt es eigenartige Strahlen. X Son corps est principalement composé d’eau. Ses yeux cristallins projettent d’étranges rayons. X Su cuerpo se compone casi en exclusiva de agua. Lanza extraños rayos con sus ojos cristalinos. X Il suo corpo è quasi interamente composto d’acqua. Emette dei raggi misteriosi dagli occhi cristallini. X 몸 대부분이 수분이다. 수정 같은 눈에서 이상한 빔을 발사한다. Y Drifts in shallow seas. Anglers who hook them by accident are often punished by their stingers. Y Dieses Pokémon findet man in flachen Gewässern. Unachtsame Gegner empfängt es mit brennendem Gift. Y Il vit en bord de mer. Les pêcheurs se font souvent arroser d’acide quand ils en accrochent un. Y Va a la deriva a poca profundidad. Si es pescado por accidente, el castigo será su punzante ácido. Y Va alla deriva in acque poco profonde. Se pescato per sbaglio, colpisce con gli aculei pungenti. Y 바다 얕은 곳을 떠다닌다. 낚시꾼이 실수로 낚아 올려 찔리는 일이 많다고 한다. 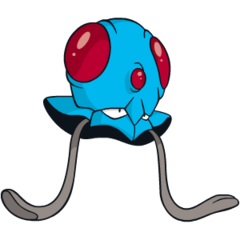 Omega Ruby Tentacool absorbs sunlight and refracts it using water inside its body to convert it into beam energy. This Pokémon shoots beams from the small round organ above its eyes. Omega Ruby Tentacha nimmt Sonnenlicht auf und bricht es in seinem Körper mithilfe von Wasser, um es in Strahlenenergie umzuwandeln. Dieses Pokémon verschießt Strahlen aus dem kleinen, runden Organ über seinen Augen. Omega Ruby Grâce à l’eau de son corps, Tentacool convertit la lumière du soleil absorbée et la renvoie sous forme de rayon d’énergie. Ce Pokémon lance ces rayons par le petit organe rond situé au-dessus de ses yeux. Omega Ruby Tentacool absorbe luz solar, la refracta a través del agua que tiene en su interior y la convierte en un rayo de energía. 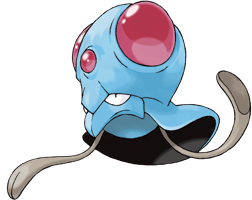 Este Pokémon tiene un órgano que parece de cristal sobre los ojos por el cual dispara los rayos. Omega Ruby Tentacool assorbe la luce solare e la rifrange usando l’acqua che ha nel corpo per convertirla in raggi energetici. Successivamente emette questi raggi dalla piccola sfera rossa che ha sulla testa. Omega Ruby 태양 광선을 몸 안의 수분으로 굴절시켜서 빔 에너지로 바꾼다. 수정 같은 눈알에서 발사된다. Alpha Sapphire Tentacool’s body is largely composed of water. If it is removed from the sea, it dries up like parchment. If this Pokémon happens to become dehydrated, put it back into the sea. Alpha Sapphire Tentachas Körper setzt sich zum größten Teil aus Wasser zusammen. Wenn es das Meer verlässt, vertrocknet es. Wenn dieses Pokémon auszutrocknen beginnt, sollte man es schnell wieder ins Wasser zurückbringen. Alpha Sapphire Le corps de Tentacool est principalement aqueux. Si on le retire de l’eau, il se déshydrate complètement. Si cela arrive, il suffit de le replonger dans un liquide pour qu’il reprenne sa forme normale. Alpha Sapphire Tentacool está compuesto en su mayor parte por agua. Si se le saca del mar, se secará y se quedará acartonado. Si este Pokémon se deshidrata, hay que echarlo inmediatamente de vuelta al mar. Alpha Sapphire Il corpo di Tentacool è costituito quasi solo d’acqua. Se pescato ed esposto all’aria, si secca totalmente. In caso di disidratazione, dunque, si consiglia di rimetterlo in mare. Alpha Sapphire 몸 대부분이 물로 되어 있어 바다에서 나오면 바싹 말라버린다. 말라버렸을 때는 바다로 돌려보내 주자. Sun They can be found lying dehydrated on beaches, but they are often still alive. When soaked in water, they will revive. Moon It drifts in shallow seas, such as the areas near beaches. If you get bitten or stabbed by its toxic tentacles, rush to the hospital. Red Drifts in shallow seas. Anglers who hook them by accident are often punished by stinging acid. Blue Drifts in shallow seas. Anglers who hook them by accident are often punished by stinging acid. Yellow It can sometimes be found all dry and shriveled upon a beach. Toss it back into the sea to revive it. Stadium Fires beams of light from its clear eyes. Floats around in shallow waters and may sting unwary anglers. Gold When the tide goes out, dehydrated Tentacool remains can be found washed up on the shore. Silver It drifts aimlessly in waves. Very difficult to see in water, it may not be noticed until it stings. Stadium2 When the tide goes out, dehydrated Tentacool remains can be found washed up on the shore. Ruby Tentacool's body is largely composed of water. If it is removed from the sea, it dries up like a parchment. If this Pokemon happens to become dehydrated, put it back into the sea. Sapphire TENTACOOL absorbs sunlight and refracts it using water inside its body to convert it into beam energy. This POKeMON shoots beams from its crystal-like eyes. FireRed Its eyes are as transparent as crystals. From them, it shoots mysterious beams of light. LeafGreen Drifts in shallow seas. Anglers who hook them by accident are often punished by their stingers. Emerald Its body is almost entirely composed of water. It ensnares its foe with its two long tentacles, then stabs with the poison stingers at their tips. Diamond Its body is virtually composed of water. It shoots strange beams from its crystal-like eyes. Pearl It drifts in sea currents. Countless fishermen are hurt by its poison stingers. Platinum Because its body is almost entirely composed of water, it shrivels up if it is washed ashore. HeartGold When the tide goes out, dehydrated TENTACOOL remains can be found washed up on the shore. SoulSilver It drifts aimlessly in waves. Very difficult to see in water, it may not be noticed until it stings. Black Because its body is almost entirely composed of water, it shrivels up if it is washed ashore. White Because its body is almost entirely composed of water, it shrivels up if it is washed ashore. Black 2 Because its body is almost entirely composed of water, it shrivels up if it is washed ashore. White 2 Because its body is almost entirely composed of water, it shrivels up if it is washed ashore.